In the nineteenth century, new cemeteries were built in many Italian cities that were unique in scale and grandeur, and which became destinations on the Grand Tour. From the Middle Ages, the dead had been buried in churches and urban graveyards but, in the 1740s, a radical reform across Europe prohibited burial inside cities and led to the creation of suburban burial grounds. Italy’s nineteenth-century cemeteries were distinctive as monumental or architectural structures, rather than landscaped gardens. They represented a new building type that emerged in response to momentous changes in Italian politics, tied to the fight for independence and the creation of the nation-state. As the first survey of Italy’s monumental cemeteries, the book explores the relationship between architecture and politics, or how architecture is formed by political forces. As cities of the dead, cemeteries mirrored the spaces of the living. Against the backdrop of Italy’s unification, they conveyed the power of the new nation, efforts to construct an Italian identity, and conflicts between Church and state. Monumental cemeteries helped to foster the narratives and mentalities that shaped Italy as a new nation. "Informatively and comprehensively illustrated, impeccably referenced and written with wise and wide-ranging insights, this fascinating tome is a very important contribution to architectural, political and social history." 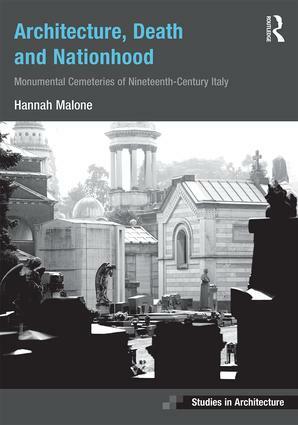 "Thanks to her ambitious research in archives, print, and cemeteries, Malone is entirely persuasive as she draws out the ways in which the latter can be microcosmic renderings of the cities to which they are attached, or when she refers to them as conveying ‘purified images of the societies that they served’. Her thorough readings of spatial arrangements, in fact, highlight these cemeteries’ formal innovations in arranging and celebrating the dead in deliberate, self-conscious correspondence with new forms of state life. In this regard, the book repeatedly teases out instances in which the cult of the dead slipped out of the total grasp of the Church, becoming one of the new Italy’s canvases for developing secularism." Hannah Malone is a historian of architecture and modern Italy. After a doctorate at St John’s College Cambridge, she held a fellowship at the British School at Rome and studied fascist military cemeteries. As a Lumley Junior Research Fellow at Magdalene College Cambridge, she is currently working on the architect Marcello Piacentini.